Rated as having one of the best Par 3s in Ireland by Padraig Harrington, the St Anne’s Golf Club is one of 53 links courses in Ireland and would make for a perfect destination on a Dublin Golf Tour. It is located on the picturesque Bull Island in Dublin so golfers can expect incredible panoramic views of Dublin's Bay from nearly every tee. 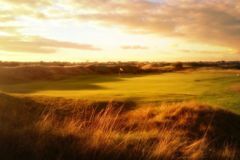 St Annes Golf Club has an 18-hole Links Course which measures at 6,717 yards off the back tees and plays as a Par 71 with 3 Par 5s. The course itself provides a true links test with undulating fairways, fast run-offs and large dunes throughout the course, which will become an immense task to avoid once the wind picks up. The stand-out hole will be the 17th which Padraig Harrington refers to as one of the best holes in the country. It plays as an 186 yard Par-3, off the back tees, from an elevated tee box, to a green nestled in between dunes so an accurate tee shot is required to avoid any awkward chip shots to save par. It’s an inviting hole to make birdie from the elevated tee to a hollow green, but any miss-hit shots and golfers will face trouble right, left and short with a number of bunkers waiting. All in all the 17th is a memorable end to what will no doubt be a great round at one of Dublin’s great links golf offerings. The practice facilities at St Anne’s Golf Club will ensure golfers have all the warm up they need before playing a links course. There is a 240 yard driving range just 200 yards from the Clubhouse, 2 nets just 100 yards from the Clubhouse, a chipping green next to the 1st tee as well as a large putting green in between the clubhouse and 1st tee, so golfers can practice all areas of their game. On conclusion of the round, the newly renovated Clubhouse is the perfect spot to enjoy a few drinks and food as it’s modern layout combined with spectacular views of Dublin's Bay and the course will create an unforgettable atmosphere. St Anne’s Golf Club will make for the perfect golf break near Dublin as it has a quality links course that will provide a challenging and enjoyable round for all golf abilities. The undulation in the fairways and greens, matched with the stunning Dublin Bay view, followed by a relaxing evening in the modern Clubhouse will create the ideal set-up for a golf break.